Just as with meat, fowl recipes had great variety. In fact, cooking fowl was even more varied because there were so many types of fowl generally available in medieval England. Dishes ranged from simple chicken dishes to elaborate, ostentatious ones such as dressed peacock. Many people ate chicken, pheasant, partridge, duck and goose meat. 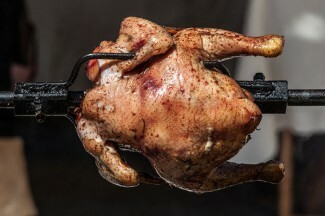 Chicken was roasted or boiled and usually stuffed with onions and herbs like parsley and sage. When in season, grapes were used as a tasty, alternative stuffing for chicken, again with herbs mixed in. 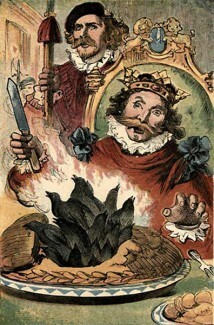 It was the wealthy landowners, however, who had the more elaborate fowl recipes in medieval cookery. Dressed swan or peacock was a favourite at banquets and feasts, usually being served in full plumage. Swans were especially popular at medieval royal banquets sometimes alongside an array of other ‘exotic’ birds such as the heron and blackbird. Proof of the latter is seen in the popular children’s nursery rhyme “Sing a song of sixpence”. Sorcell Rosted, Wodekoke, & Snyte – Small game birds, wrapped in bacon or salted ham and then baked in an oven. Chik Endored – Roasted chicken, covered (endored = gilded) in a batter containing ginger, pepper, saffron and salt. In a royal household, this batter might even be replaced by gold leaf!